American Indian Beadwork | Plateau Tribes Pictorial Works | Skinner Inc.
By the turn of the 20th century, pictorial beadwork had become very popular, both for the Indians’ own use, and also to meet the demand of the ever increasing tourism market. Today, these items are collected both as Indian art and folk art. 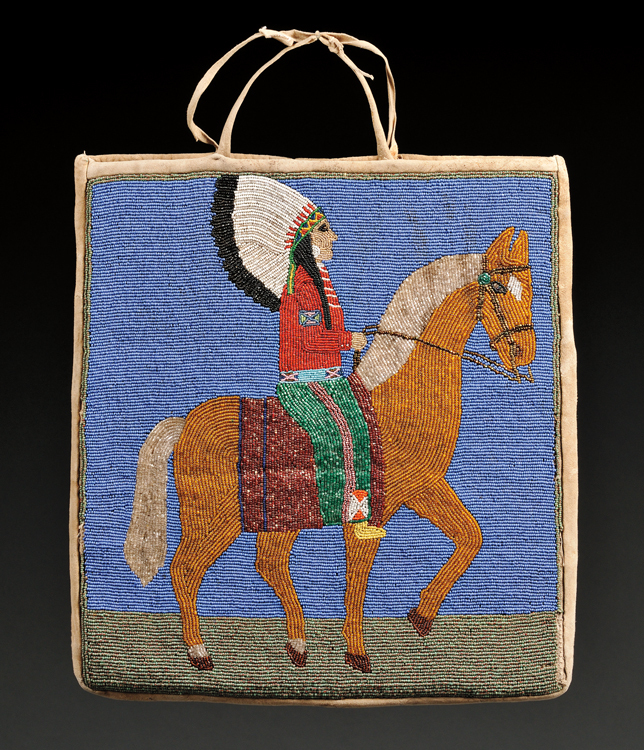 The hide handbag shown here comes from the early 20th century and depicts a mounted warrior, probably a Nez Perce, who is wearing traditional period clothing including an eagle feather headdress, loop necklace, panel belt, and cloth leggings. The Lakota were also famous for their pictorial beadwork from the early reservation period into the first quarter of the 20th century. This example will be offered on May 12th during our American Indian & Ethnographic Art auction alongside a fine selection of Plains Indian beadwork, a pictographic muslin, and several fine weapons. This entry was posted in Blog and tagged American Indian & Ethnographic Art, american indian art auction, american indian beadwork, Douglas Deihl, History of Art & Antiques, Lakota, Nez Perce, pictorial beadwork, Plains Indian, plateau tribes by Douglas Deihl. Bookmark the permalink. We have an old powderhorn inscribed with a crude map of the area around Sandwich, N.H. and do not know of its authenticity. Thank you for your comment. We’ll follow up over email to discuss your powderhorn.